Delivery of the X3 went off without a hitch. Rachel and I picked it up at the UPS Freight depot at about 5:30pm. By 8pm it was disassembled and in the shop waiting to be cleaned. Disassembly was reasonably straight forward, and it broke down into very manageable chunks. 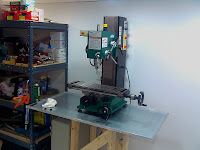 That enabled me to get it into my basement shop without any lifting equipment. Cleaning was also straight forward. WD40 did an excellent job removing the Red China grease. I per fer it for cleaning jobs such as this as it contains corrosion inhibitors, leaving the shiny cast iron protected as well as clean. The only thing I wasn't truly prepared for was just how heavy the X3 is. With the exception of the sheet metal column cover, every stinkin' component was heavy. Being the first massive piece of machinery I've bought and had to move and clean, I wasn't fully mentally prepared for what to expect. No troubles though, as I think the heaviest component comes in around 75 to 100 lbs. Currently the X3 is "mounted" using the included leveling feet, and is sitting on top of a sheet metal tray. Given I don't have sheet metal bending abilities (yet) I ringed the pan with 3/4" aluminum angle stock, and sealed it with silicone. It will serve as a chip pan to begin with, and later the drain pan for the coolant system (more on that later). The sheet metal is screwed to a 2x4 based stand which does a fine job of supporting the weight of this beastie. The controls cabinet from my X1 (micro mill) CNC project is already mounted to the side of the stand. The direction I'm going with this mill's CNC/coolant containment enclosure will be a little different than the X1. Rather than a fully enclosed version, I'm going to use strategically placed splash shields that will direct the large majority of coolant and chips into the lower tray. It will then drain into the filtering and recirculation system from there. This mill is simply too large in my mind for a full enclosure. By scaling down the enclosure I think I can save some money and speed up time to production. As I said in a previous post, this will be getting a pulley driven ball screw system run by steppers. I'm going to reuse the 276 oz-in steppers from my X1 project. I'll probably go for 2 to 1 reduction on the X and Y axis, and perhaps 3 to 1 on the Z axis. I'm not sure if a counterweight will be needed for the head, but I suspect not with that level of reduction. Before I get rolling on that though, I'm going to do some testing on the steppers. I'll be looking for practical upper RPM limitations, as well as realistic torque ratings at various speeds. That will give me a better idea of what gear reductions I'll need, and what traverse speeds I can expect. All in all, there's no doubt that I'm starting out with a far superior machine this time. I'm looking forward to spectacular results! The other day, while trying to mill a counter bore in some steel, I came to the realization that my Micro Mill wasn't cutting it (pun intended). The upgraded spindle drive system was definitely up to the task, but the rigidity of the Z-axis was frustrating. Even with the new brass gib, I have to have the gib screws so tight that the 276 oz-in stepper cannot reliably move the Z-axis. The Z-axis is a known weak point on this machine. With the somewhat non-standard pitch on the lead screw and the slop in the dovetails, milling with it has always seemed like a chore to me. I suppose one could argue that "I got what I paid for" in that it is a small, hobby sized machine, but none the less, I expect more. After some failure analysis, I came to the conclusion there were really three factors at play. First, my Z-axis lead screw is slightly bent. That really doesn't come into play until near the lower limit of travel, but it is still a factor. Second, the dovetails do not seem to be very precisely machined. There is some binding at the lower limits as well, even with the bent lead screw disconnected. Third, there is some binding in the stepper drive setup, which is parasitically wasting power. The cost to fix these items is significant, more so in time and frustration than in cash cost. And obviously, after spending more time and money on this machine it would, at it's core, still be a "micro mill." Do I want do upgrade this machine further, or is there a better route? What are other people upgrading to when they outgrow this mill? I have to admit, a while back when the Sieg X3 mills started showing up in the US, I thought they were an awesome machine. Inch lead screws on all three axis, beefy square column, bearings on the hand wheels, and a standard R8 spindle were all appealing features to me. Initially they were pretty expensive and there were only a few places to get them. I had planned on checking back in to these machines once the newness in the market wore off, but hadn't gotten around to it. So, I started my research there, and have to say it pretty much ended there. Most of the comments on the various forums were very favorable. The videos on YouTube of it operating were very impressive. There are really few options in that class of machine. The Super X3 has some nice features, but given that my machine will be CNC'd, the added features (and associated cost) of the SX3 are not needed. I certainly didn't want to go with an X2 or Mini Mill, as I knew it would need upgrades right out of the box. I've been down that road with my X1 and didn't want to travel it again. On the other end of the spectrum is the Rong Fu 45, which is larger, and more expensive. Given the leap I would be making going from the X1 to the X3, the Rong Fu seemed like overkill. Then there are, of course, the round column mills. The only "accurate" Z-travel those offer is in the quill, which doesn't lend well to CNCing. Also, as the quill is extended, rigidity is reduced. Not an issue for drilling necessarily, but definitely for milling. I decided to get mine from Grizzly Industrial. It is their part number G0463. I missed Grizzly's holiday sale by one day, so I emailed them to see if I could get the holiday pricing. They were very willing to accommodate me and, after some prodding, even threw in some accessories to sweeten the deal. It's on a truck, headed my way. The initial upgrades will be ball screws on all three axis and stepper based, pulley driven CNC. I will be recycling the controls and motors from the X1, so the road to full CNC should be a short and frustration-free trip!